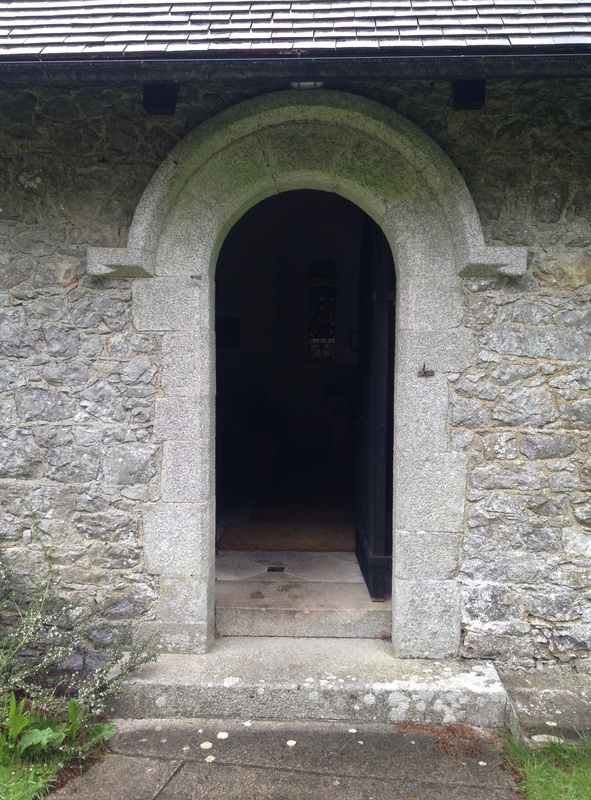 This church at Coolcarrigan, County Kildare has rightly been described by art historian Nicola Gordon Bowe as ‘a tiny gem of the Hiberno-Romanesque Celtic Revival.’ The building is not large and was built primarily – although not exclusively – for members of the family on whose land it stands. Seemingly prior to the church’s construction the first-floor room of a thatched house in the nearby farmyard was used for religious services, so one understands why in the early 1880s Robert Mackay Wilson decided to build something more suitable: the completed church was consecrated in 1885 by William Plunket, fourth Baron Plunket and, since the previous year Archbishop of Dublin (his statue can be seen on Kildare Place in central Dublin). Located in an opening of woodland, it has been in continuous use ever since, and services are held there on two Sundays each month. Coolcarrigan church’s design derives from that of the 12th century Temple Finghin and McCarthy’s Tower at Clonmacnoise, County Offaly, believed to be the earliest instance of these two structures combined together (as opposed to being placed adjacent to each other). In the latter instance, they are part of a larger architectural ensemble, whereas here they stand alone. 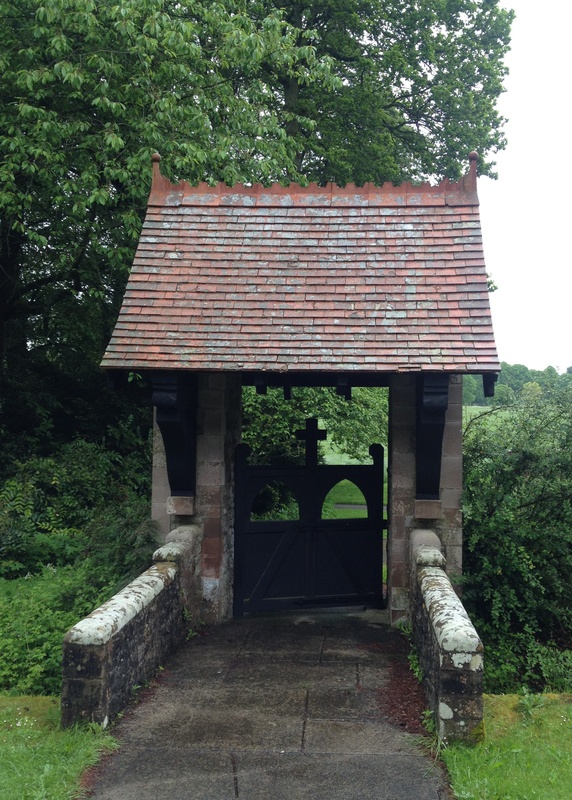 Furthermore, an unusual feature of the County Kildare site is that it is surrounded by a circular dry moat, access to the building only being gained by passing through a lych gate with its red-tiled roof: this is an architectural element more commonly found in the eastern counties of England than in Ireland. However, thereafter the Celtic spirit reigns throughout in this sturdy little granite building. There has been some discussion about who might have been responsible for the church’s design, with the names of both James Franklin Fuller and Sir Thomas Drew advanced as the possible architect. No papers concerning the commission are known to survive, and a reference to the building in the Irish Ecclesiastical Gazette of January 5th 1884, while noting the construction of the building ‘following the example of some ancient Irish churches,’ does not credit anyone with the work. In favour of Fuller is the fact that he was Diocesan Architect at this date, worked in the Hiberno-Romanesque style and built a number of other private churches. On the other hand, Drew’s 1910 obituary apparently mentions additions to Coolcarrigan and, like the estate’s owners, he was an Ulsterman. Unless new evidence comes to light, like so many other matters associated with religion, the architect’s name must remain a mystery. 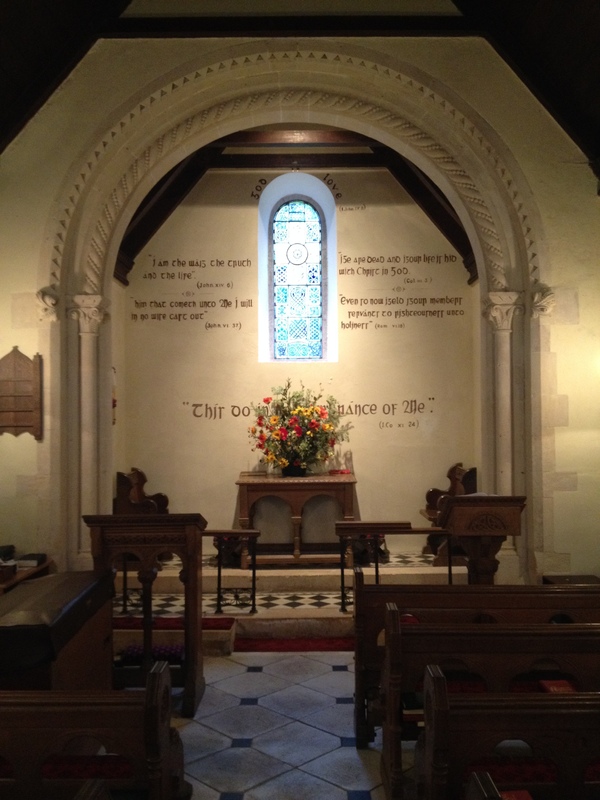 We know a great deal more about the parties responsible for the church’s interior decoration. One of those who literally had a hand in the work was Douglas Hyde, himself the son of a Church of Ireland rector (indeed his grandfather and great-grandfather had likewise been Anglican clergymen). The future first President of Ireland and leading figure in the Gaelic Revival movement was an undergraduate at Trinity College Dublin at the same time as the Wilson’s elder son Robert and so came to know the family. 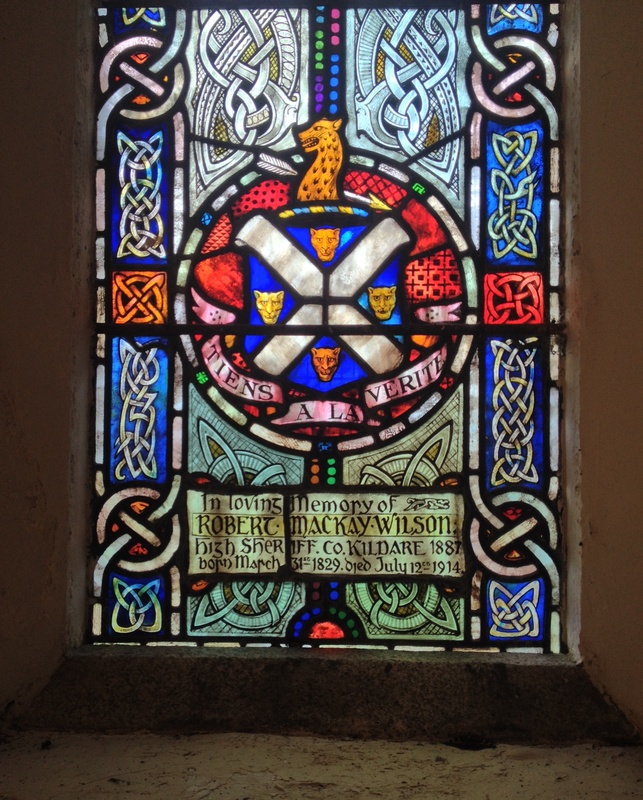 Sadly, as one of the church’s windows explains, Robert Wilson died in 1887, three years after his younger brother; two of the Wilson’s daughters likewise predeceased their parents. All the siblings are commemorated here in stained glass. Since he graduated from university in 1884, it must have been around that time that Douglas Hyde came up with the scheme for the texts which are painted onto the walls using a distinctive Irish alphabet. Given his background, Hyde would have been well-placed to choose apposite scriptural quotations. It is worth noting that the various items of church furniture such as table, lectern, reading desk, chairs and so forth are likewise carved in traditional Celtic patterns. 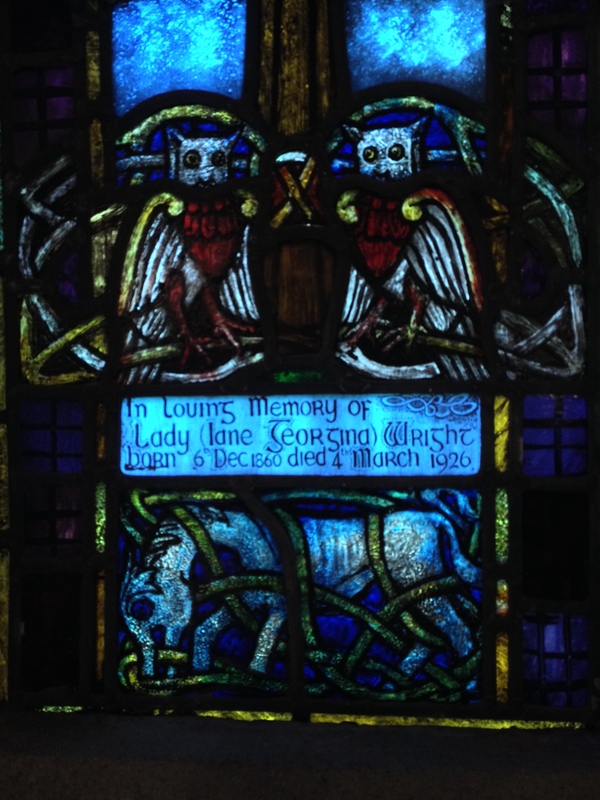 The two earliest of Coolcarrigan church’s splendid stained glass windows, memorials to the Wilsons’ deceased sons, were, according to Paul Larmour, not of Irish manufacture: ‘I would guess they are by Heaton Butler & Bayne the English firm. 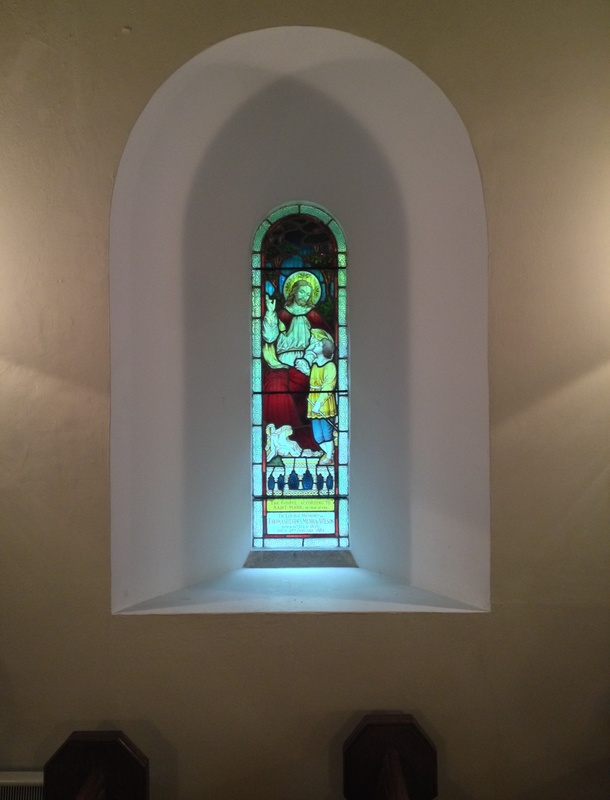 They did the stained glass in Clane and also in St. Brigid’s Cathedral, Kildare (where J.F. Fuller was in charge, restoring the east end in the 1880s or 90s).’ However, the other three windows on the south and north walls, installed in 1911, 1912 and 1927 respectively, were all made by Clare-born Catherine O’Brien who for almost forty years from 1906 worked at An Túr Gloine (The Tower of Glass) the co-operative studio established in Dublin in 1903 by artist Sarah Purser at the instigation of Edward Martyn (a co-founder of the Abbey Theatre). 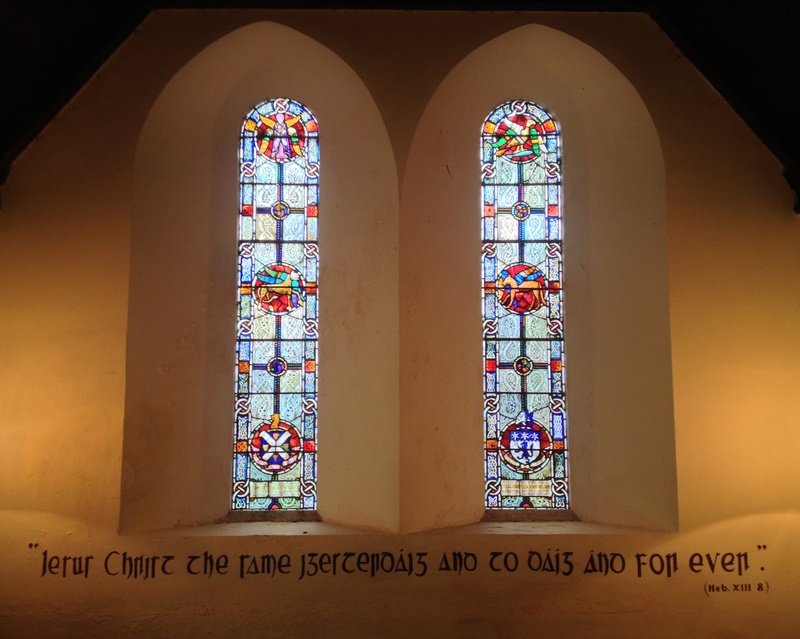 An Túr Gloine’s output did much to encourage interest in the emergence of a national style in this medium, since for much of the 19th century new churches had imported insipid and generic stained glass from Germany and other countries. 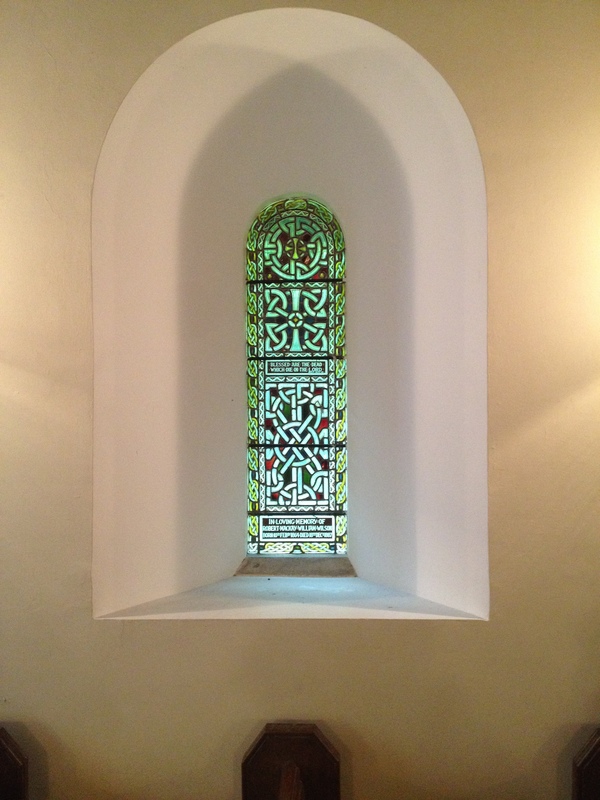 Hence the abundant use of Celtic designs in the Coolcarrigan windows, as also in the large pair in the west wall (dating from 1916), likewise designed by Catherine O’Brien and commemorating Robert Mackay Wilson and his wife Elizabeth. 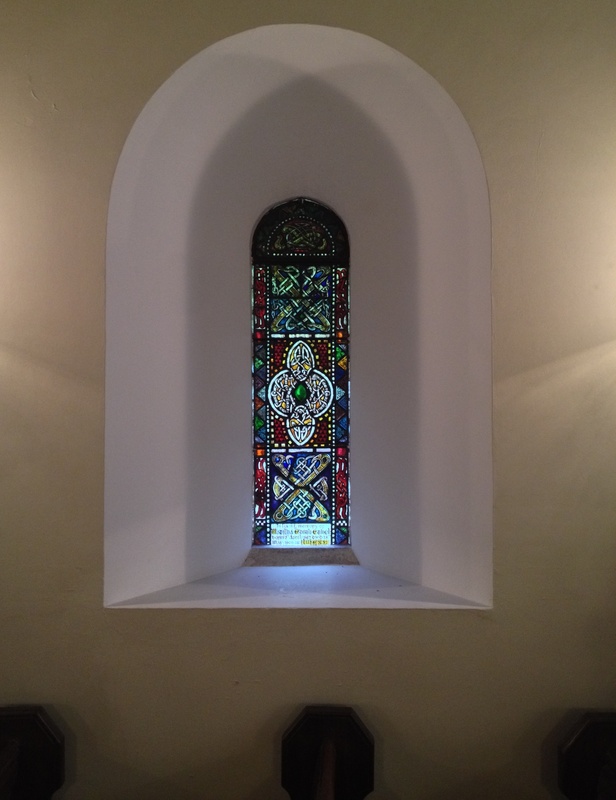 That above the altar on the east wall is the most recent window, installed in 1980 and designed by Patrick Pollen who almost three decades before had moved to Ireland in order to study at An Túr Gloine, and who only died four years ago. 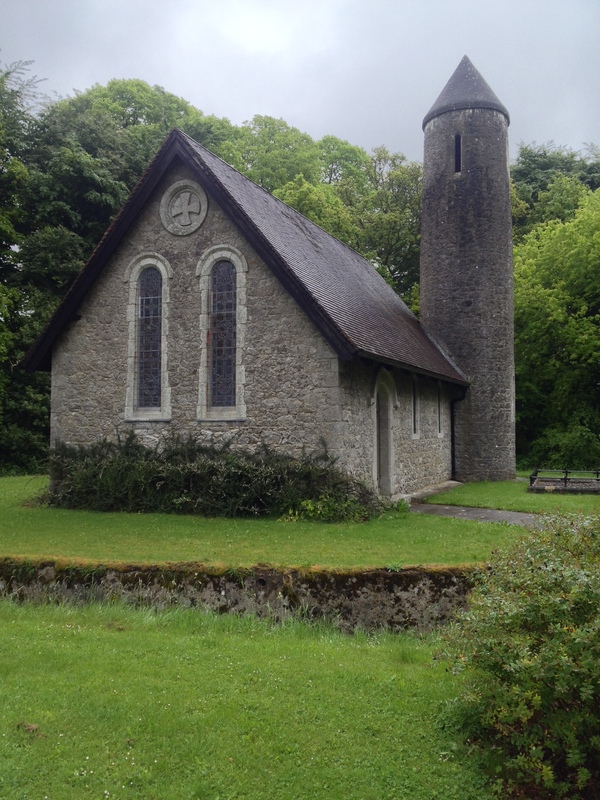 As has been mentioned, Coolcarrigan church continues to serve the function for which it was originally intended, and continues to be scrupulously maintained by the present generation of the family who commissioned the building 130 years ago. So many churches, especially those formerly in the care of the Church of Ireland, have closed over recent years it is a rare pleasure to find one, particularly as here embodying the ideals of the Celtic Revival, still loved and in active use. Long may this remain the case. 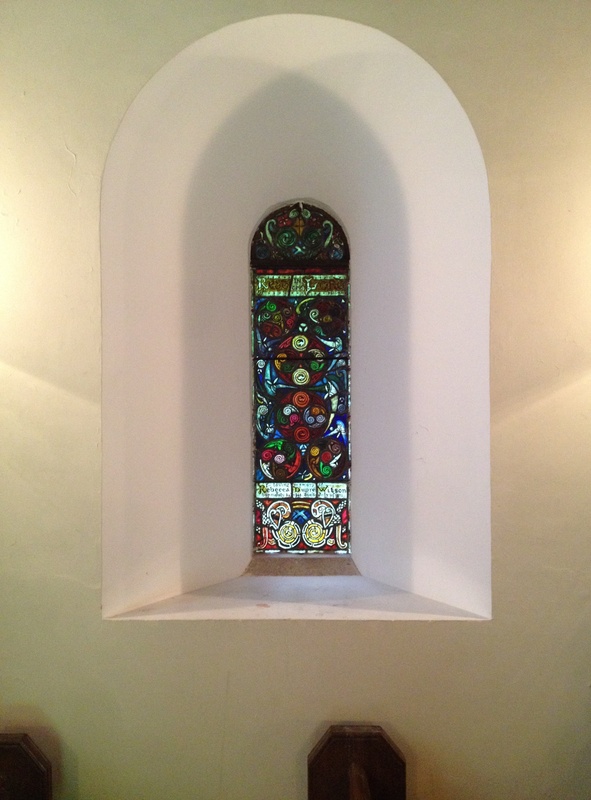 This entry was posted in Architectural History, Irish Church, Kildare and tagged Architectural History, Coolcarrigan, County Kildare, Historic Interiors, Interior Decoration, Old Church. Wonderful article. What a little gem. I never tire of reading your posts. The photos are absolutely enchanting. Thank you for that kind compliment, which is much appreciated. Please spread the word about the Irish Aesthete, it is always a delight to encourage more interest in Ireland’s architectural heritage. 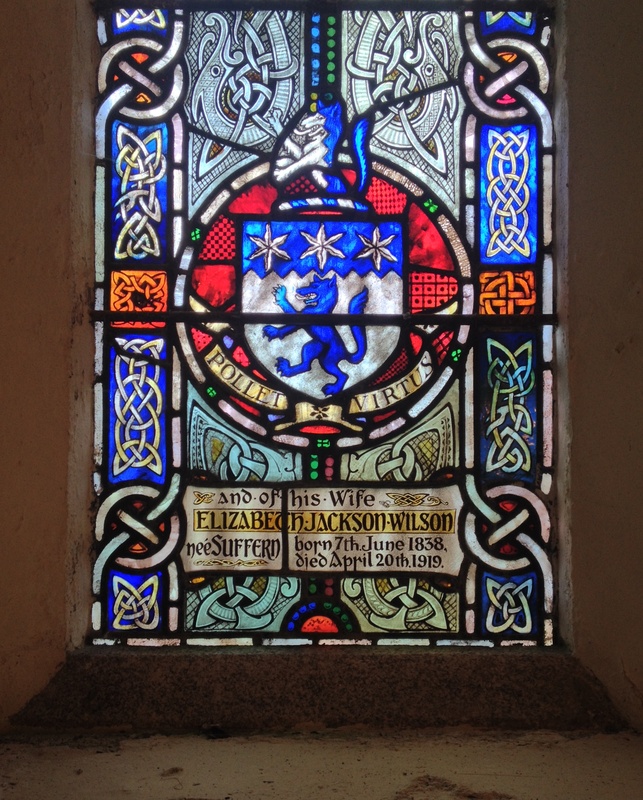 Apropos stained glass windows;Have you seen the 3 Sarah Purser windows in Inistiogue Church of Ireland church.My grandmother,Marguerite Connellan,later Solly-Flood.commissioned them in memory of her parents and brother,Peter,who was killed100 years ago ,this year. Thank you for all this, most interesting. 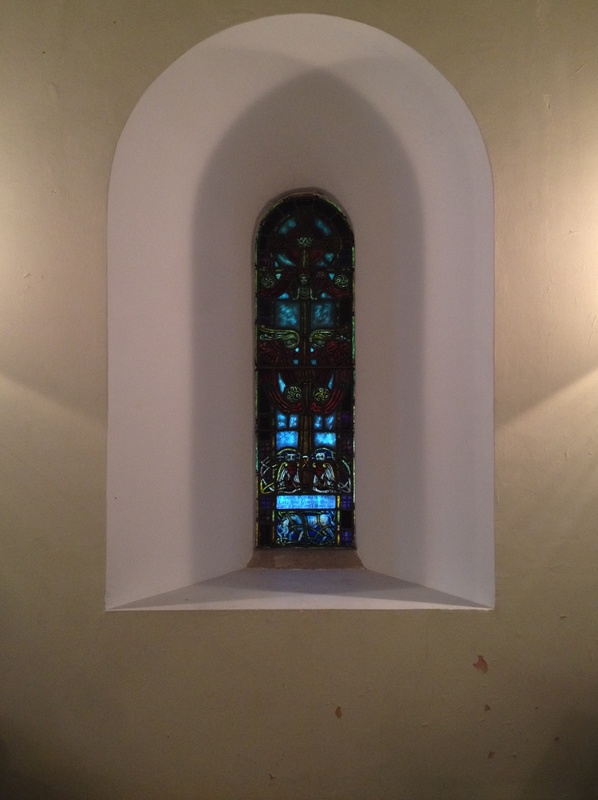 I have never managed to see inside the C of I church at Inistigue: it is usually shut (except most likely for Sunday services but I have not been in the locale on such an occasion). I must make an effort to see them later this summer. And I didn’t know either about the floor at Ballyduff: again, I should make a point of calling in when in the area. Thank you again for this information, it is much appreciated.